Events in Scotland and Catalonia have given Bretons hope as they continue to fight for devolution and cultural preservation against the ultra-centralised, anti-regionalist French state. Reunification demonstration Nantes on 19/5/14. Agence Bretagne Press. Some rights reserved. On 25 November, a new law on the territorial organization of the French regions was passed by the National Assembly, by a very small majority. Of the 530 expressed votes, 277 were for and 253 were against. Two main regions are “victims” of the new organization, Alsace and Brittany. Alsace, because it simply disappears into a huge, new region regrouping Champagne-Ardenne, Lorraine and Alsace, in effect meaning that Alsace itself won't exist anymore as a political or administrative entity. Meanwhile for Brittany, the law confirms the amputation of its territory, rebuffing the return of the fifth historical department of Loire-Atlantique and the historical Breton capital of Nantes to the region of Brittany. For Brittany, which began life as kingdom in the ninth century, evolved into a duchy, and since the French Revolution has been a region, this was chance to regain its historical integrity. During the Second World War, the fascist Vichy government took the richest of Brittany’s five departments, Loire-Atlantique, and used it to create a new, artificial region called Pays de la Loire, which still exists today. After several demonstrations and public debates, 85% of the Bretons in the administrative region of Brittany and 70% of the Bretons in the Loire-Atlantique department claimed to be clearly in favor of the reunification. Still the government and the National Assembly said no. The official reason given by the government is that it wants to optimize the existing regions, making them more powerful and able to compete at a “European level”. But a reunified Brittany would have respected all the objectives wanted by the government, as Breton MPs have argued. The “No” to a Breton reunification, and the choice to dilute Alsace, are explainable by a non-official reason. After having watched with fear and apprehension what happened in Scotland and Catalonia, the French centralized state used every legal trick to prevent any risk of such situations in France in the future. The aim was, is, and will be, to weaken any regional or cultural identities that are not explicitly “French”. With such lofty goals in mind, it is not surprising that regardless of the legitimate justifications for reunifying Brittany, the government would never allow it. It is not surprising either that Alsace was condemned to be consigned to the dustbins of history. It is important to understand that in France - by law – there can be no other people than the “French” people. Bretons, Alsatians, Corsicans…they may exist as administrative curiosities for local populations, but legally – they do not exist. Since the Revolution, France is “One and Indivisible”, and the different identities and territories can only be considered as folkloric particularities, certainly not specific political entities of any sort. It is the reason that France is the only country in the Council of Europe - apart from Turkey - to have not signed the European Framework Convention for the Protection of National Minorities. In fact the original goal of the French government was to make Brittany disappear altogether by fusing it with the neighboring region of Pays-de-la-Loire to create a huge and illogical “Grand-Ouest”. That particular catastrophe was avoided at the last minute thanks to an active Breton lobby close to the President. 1) The Bretons are becoming more and more aware of their status as a distinct Celtic People, albeit happy to be part of France and be French citizens. 2) Bretons have a strong regional identity that is just as important as their national (French) identity. 3) A unified Brittany, including the Loire-Atlantique region, would have a population of 4.5 million. This is far greater than either Alsace (1.8 million) or Corsica (320,000). For comparison, the population of Scotland is 5.3 million. 4) The territory of a reunified Brittany would be 34,000km/2, which is larger than Belgium and almost as large as the Netherlands. 5) The return of the wealthy Loire-Atlantique department to Brittany would allow the region to develop in more autonomous way. What do Bretons actually want? Of course the main problem with all of this is that the majority of Bretons don’t actually want independence. Realistically speaking, only about 5% of the population see independence as a concrete political objective. This is perhaps the most important point to have in mind about the Breton political situation. Nobody in Brittany sees a contradiction with being both Breton and French. The struggle for independence is an old dream, part of the Breton Celtic culture and history, but not considered a serious ambition by Bretons today. Still, it is and has always been one of the biggest fears of the central power, heightened by the recent Scottish referendum and Catalan consultation. Even though nobody, in Brittany or in Paris, among the members of the government or the parliament dares speak openly about Breton independence, it remains a taboo, albeit a “false taboo”. What the majority of the Bretons really want is more decentralisation, more local powers, and maybe the beginning of ‘devolution’. Historically and politically, Brittany has always been less dependent on Paris than other regions, and it is only very recently (1789 and the Revolution) that Brittany had to give up its local powers and institutions – including its local parliament and local supreme court of justice - to a new conception of a centralized Republic. In a way, the political existence and autonomy of Brittany has been the victim of a victorious Jacobinist and then Bonapartist spirit, which never let Brittany recover its former status. Today the population of Brittany still miss, consciously or not, such a state of political existence, increased by a geographic situation and a revival of a “Breton” awareness thanks to artists, doctors, researches, contacts with the other Celtic nations and the new concepts of Peoples and Stateless nations. Despite this, Bretons are still very attached to the French Republic, and the main autonomist party, the UDB (Breton Democratic Union), tends to get very few votes. The traditionalist and republican nature of Brittany means that when it comes to elections, voters naturally favour the main French parties. It is something of a contradiction that many Bretons take the idea of autonomy seriously, but don’t take the main autonomist party seriously at all. Since the French people became “One and Indivisible” after the Revolution, the Bretons have been subjected to ridicule, marginalization and persecution. Understandably against the centralization and de-regionalisation of the country since 1789, many Bretons fought back. There were pro-monarchist uprisings and pro-Catholic demonstrations against secularization in the early years – both violently quelled. The Breton language – part of the Celtic family and thus mutually unintelligible with French – was banned, and traditional Breton social bonds based on historical parishes were abrogated. Brittany suffered economically too. Geographically isolated, nothing was done to industrialize or modernize the region along with the rest of France. Many Bretons were forced to emigrate to foreign countries or to Paris. Many joined the National Coast Guard, where they put their skills as a nation of sailors to good use. Brittany gained a sad reputation as a place of poverty and superstitions, of alcoholic and backwards people. Until the first half of the twentieth century, in newspapers and sometimes in official speeches, references were made to the “Breton savages” or to a colonized people that had to be “enlightened” by a French civilization. Even if such persecutions stopped after the Second World War, France is still the heiress to a very centralized conception of power. Even if the regional identities and people are not officially considered as threats to the Republic, they must not be recognized as legally existing. The Breton language is no longer banned, but is still prohibited in public and legal life. The Bretons can learn it if they want, they can use it in their private life, and Breton lessons even exist in some schools, but it is illegal to use it in the public institutions. It is forbidden to use it in courts, in the Parliament, or in any official document. In the latter part of the twentieth century, the Bretons gained a reputation as hard workers, honest, straight and brave people. It is now a region recognized as highly educated and producing a lot of artists, doctors, army officers, and politicians. Nationally and internationally, the Bretons have a good reputation as cultivated, friendly, and very festive people. But that new image is tolerated as far as no political demands are made. We clearly saw that at the occasion of the territorial reform. As soon as the Bretons express the wish to regain their territorial integrity, unified Brittany and a true and official recognition for its people, all the hate, the distrust, the prejudice and the clichés suddenly wake up from the past. Very shocking reactions appeared among the political class just as among the French population, and many words and declarations could have been punished by the law. But no criminal prosecution can be pursued against such racism, because officially in France there is just one people, so no discrimination or racism can strike a people that does not exist. The conclusion is that the Bretons are liked and promoted by the French public opinion, on the one condition that they submit to the political system and organization and spirit of a centralized state. The Breton movement arguably reached its peak in the 70s and 80s when two groups, ARB (Breton Revolutionary Army) and FLB (Liberation Front of Brittany), chose the path of violent resistance, committing a series of bombings against French governmental buildings in the region. The groups always made sure to carry out the bombings at night, when they knew the buildings were empty. However, when in the early 90s a young girl was accidentally killed by one of their bombs, the two groups gradually faded out of existence. Gathering of the "Red Caps" in western Brittany. Public domain. Culturally speaking, the Breton movement has always had, since the 70s, the support of the majority of the population, and today more than ever. But it has been difficult to unify the Bretons politically behind a pro-autonomy party. 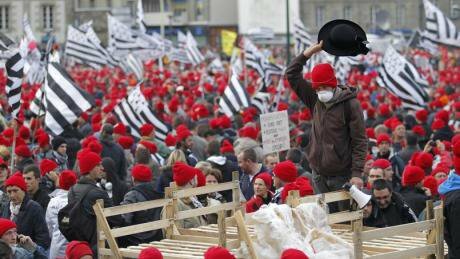 In 2013 there was a huge popular revolt in Brittany against the imposition of a new tax. The revolt started in western Brittany and was lead by workers and farmers. Traditionally Brittany has always been a region of popular movements based on social justice, drawing people from all parts of society from cobblers to lawyers. The Bretons have a tradition of protest and resistance against decisions taken in Paris, and several times it have managed to make the central power amend or abandon laws or projects because of the Breton mobilization. However, last year’s popular revolt gave birth to the “Bonnets Rouges” (or “Red Caps”) - a reference to a significant historical protest against the royal policy in Brittany and the creation of new taxes in the duchy of Brittany without the consent of the Parliament of Brittany in 1675. More than being a simple revolt against unpopular decisions, it became the public striking force for more autonomy in the region of Brittany. 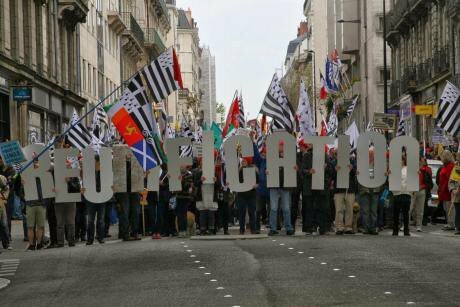 Today, and after what happened in Scotland and Catalonia, as well as the popular protests against the territorial reform law, a serious movement appeared among the Breton population, at every social or professional level. Among the 27 MPs from Brittany, only 9 or 10 fought for the reunification of Brittany in the National Assembly, and were present during the popular demonstrations in the region. The Regional Council of Brittany is also clearly in favor of the reunification and more local prerogatives, but has very little power and can only really add moral, rather than political, weight to the cause. The Scottish referendum has certainly raised spirits and eyebrows in Brittany. A few days after the vote, 30,000 people demonstrated in Nantes, the capital of the department of Loire-Atlantique and historical capital of Brittany, asking for a reunification. Placards displayed the slogan ‘DEMOCRACIE – UK:1 / FRANCE:0’. Of course any kind of referendum or public consultation in Brittany is a long way off, due to the ultra-centralised French state and their dogmatic “one and indivisible” ideology. But events in Europe have given Bretons hope that change in cultural preservation and devolution can be achieved peacefully and democratically within states. With the concept of the right to self determination for the people of Europe, the Bretons are more and more tempted by a local referendum, or even just a local consultation, to ask simple questions to the population on matters of autonomy or territory. The Breton movement would like to use such results to legitimize their demands. What may increase tensions is the fact that the government has clearly said that no such thing would be organized or tolerated. The government reminds us that under our Constitution, the decisions are taken by the President and its government, and validated by their majority at the National Assembly. The Breton matter shows the prescient contradiction between the will of more democracy and the intention to keep the decisions in the capital in the hands of the executive power. In the few past months we have observed that the more the spirit of subsidiarity and local democracy evolves in Europe, the more France returns to a state of complete centralisation. Having rebuffed the reunification of Brittany, and refusing it the right to consult its population, the French government has made it understood that it wouldn't be against at least one change and one evolution in that region. There is indeed a wish to create an Assembly of Brittany, imagined by Breton MPs and thinkers, and inspired by the Assembly of Wales concerning its potential constitution and prerogatives, which would replace the different councils of departments and the council of the region. Such an opportunity would be officially justified by a simplification of the multiple administrative entities, but in the heart of the Bretons it would clearly be a first step to the recovery of any sort of autonomy. The Breton movement is already asking for it to be accompanied by a political status for the region, but the words ‘autonomy’ or ‘federalism’ make the French state very uncomfortable. However, after what happened during the territorial reform, the Bretons are disappointed and skeptical, and the government has lost their trust for good. Once again the majority of the Bretons would agree with such an Assembly, and even proclaim it publicly, but once again the government will decide it on its own, from Paris, and with all its antagony towards the potential “secessionist” region of Brittany. Hopefully Europe, and the French government, will eventually wake up and smell the coffee.